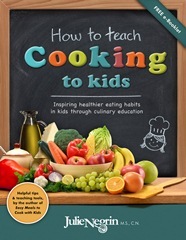 The online eCourse, How to Teach Cooking to Kids will be offered again soon. Check out the Table of Contents for an overview of what's coming. If you haven't signed up for my newsletter already, do so now so that I can share more FREE educational tools and update you when the eCourse, How to Teach Cooking to Kids is available. -Recipes that have been thoroughly tested and carefully written so that novice cooks and children can confidently follow the instructions. -Guidelines on how to safely incorporate children in the cooking process. -Advice on how to purchase high-quality ingredients and kitchen equipment. -Recipes that can be made kosher and are nut-free (including many that also dairy- and gluten-free). -Dishes made with moderately priced ingredients that can be found in most grocery stores. "A love of food, a love of children, knowledge of nutrition, skill in the kitchen, passion, compassion, wisdom and insight- what a delicious recipe! 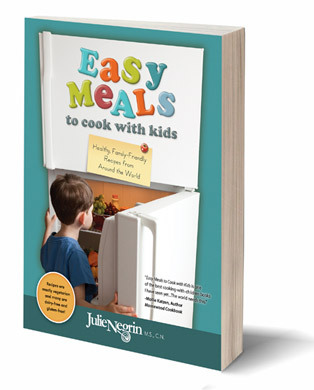 That is exactly what Julie serves up in Easy Meals to Cook with Kids. I loved every bite - and am confident you will, too!" –David L. Katz, MD, MPH, FACPM, FACP, President & Founder of the Turn the Tide Foundation, Inc.
"Julie is an enthusiastic, patient and gifted teacher to pre-schoolers. Her gentle and engaging presence has drawn my reserved daughter into the class. Sania loves to come home and recreate her favorite dishes in her play kitchen! She dons her apron and says 'I Julie, Mom. No touch the blender. I make banana ice cream.'"